I may earn a commission or products from the companies mentioned in this post. All opinions are my own. Success affirmations can be a phenomenal catalyst to success. Not only when you repeat positive affirmations do they happen quickly, but you begin to believe them because you repeat them so often. Anything that you continually say becomes a part of you. There are so many celebrities that used positive affirmations to gain success, if they can do it, anyone can. They were not more special than you, they just harnessed the power of affirmations. An affirmation is a positive agreement to something. When you speak affirmations out loud you are agreeing to something. Your words have power. Why not use them for something positive and transform your future? At the end of this post you will have an opportunity to download my favorite success affirmations. Pick the affirmations that relate best to you and your goals. Highlight your favorites and or circle them. Whatever it takes to help you use them do it. Perhaps all of the affirmations speak to you, and if that is the case you can read all of them! The more you read these success affirmations the faster they will come true. If you can read these affirmations for a successful life twice a day (morning and evening) because of the frequency they will be an incredible motivator. When you download the PDF at the end of this post print the affirmations and place them someplace that you will easily see them. Because if you see them, you will use them more often! Hang your success affirmations on your bathroom mirror, leave them on your night stand or wherever they are most convenient for you. I am a money magnet for myself and others. I am good with money, I rule it, it does not rule me. Success comes easily for me. Because I am worthy of love, success and wealth I have it. I do not ever give up on my dreams and goals. I plan out my goals in order to achieve them quickly. My income increases each and every month. I am aware of my perfect path in life and I follow it closely. No, I do not self sabotage. I am not afraid to invest in my future. Fear is not part of me and I am not afraid to dream BIG. I am confident in myself and my abilities. I can do what it takes to get the job done. With hard work I can do anything I set my mind to. Anything I touch is better after I have put my hand to it. I am grateful for all that I have. Because I already possess all the abilities I need, I will be extremely successful in every area of my life. No one else gets to decide how I feel. I work on my goals daily so that I can achieve them. I am a creative human being. My body is the perfect weight for me. The right people are in my life and the wrong ones go elsewhere. I have confidence and courage to get what needs to be done in my business. I am blessed with beautiful relationships. There is only one me and I have a unique place in this world. I miss 100 percent of the shots I fail to take, I will take the shot. I strive to always be the best version of myself. My life is filled with love and appreciation. If you have your affirmations but don’t remember to say them, what good are they? It does help just to have them written down. Writing them in your own handwriting will make them happen too. However, reading them daily really gets them deep down into your heart. Also, reading them daily helps your mind create a map to achieve them. So to be safe, do both! Try setting reminders on your phone because this trick will help you remember to speak your success affirmations. A post it on your mirror with your favorite affirmation will also be a great reminder. Write your affirmations in your planner like an appointment to remember to speak and read them every day. Do whatever works best for you to keep you on track to your goals because the best affirmations are the ones you use. Whether you are a blogger, want to be blogger, entrepreneur or employee these affirmations will help you get to your best life now. Because you are unique, so are your needs and affirmations. Don’t be afraid to add your own affirmations to the list! In fact, in order to be the most successful for YOU add tailored fit affirmations to the list. I left some space at the end of the list on the download just for this reason. So there you have it, 30 Success Affirmations you can use to skyrocket your success. Don’t forget to download your affirmations and speak them daily so you can fast track that success of yours! Let me know in the comments which are your favorite affirmations and why. I’d love to hear from you. Have You Found Mr. Right, Or Is He Just Mr. Right Now? 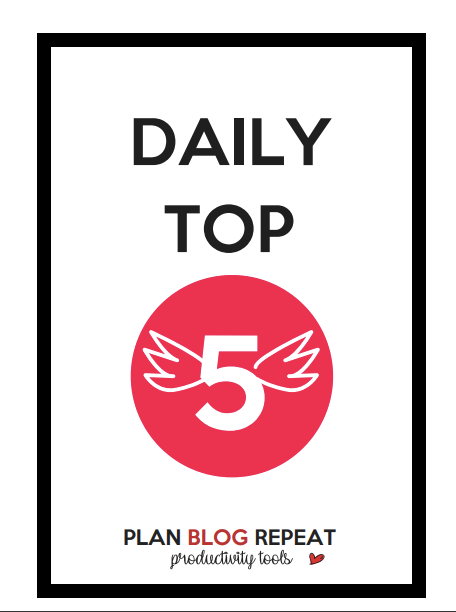 With Plan Blog Repeat's Productivity Tools - My Daily Top 5 will not only be your top 5 to do's but your Top 5 success Habits you can follow every day.